3-way solenoid valve Three-way solenoid operated valves have three port connections and two valve seats. One valve seal always remains open and the other closed in the de-energized mode. When the coil is energized, the mode reverses. The 3-way solenoid valve shown in Fig. 2 is designed with a plunger type core. Various valve operations can be obtained according to how the fluid medium is connected to the working ports in Fig. 2. The fluid pressure builds up under the valve seat. With the solenoid coil de-energized, a conical spring holds the lower core seal tightly against the valve seat and shuts off the fluid flow. Port A is exhausted through R. When the coil is energized the core is pulled in, the valve seat at Port R is sealed off by the spring-loaded upper core seal. The fluid medium now flows from P to A. Pivoted-armature solenoid valve Unlike the versions with plunger-type cores, pivoted-armature valves have all port connections in the valve body. An isolating diaphragm ensures that the fluid medium does not come into contact with the solenoid coil chamber. Pivoted-armature valves can be used to obtain any 3-way valve operation. The basic design principle is shown in Fig. 3. 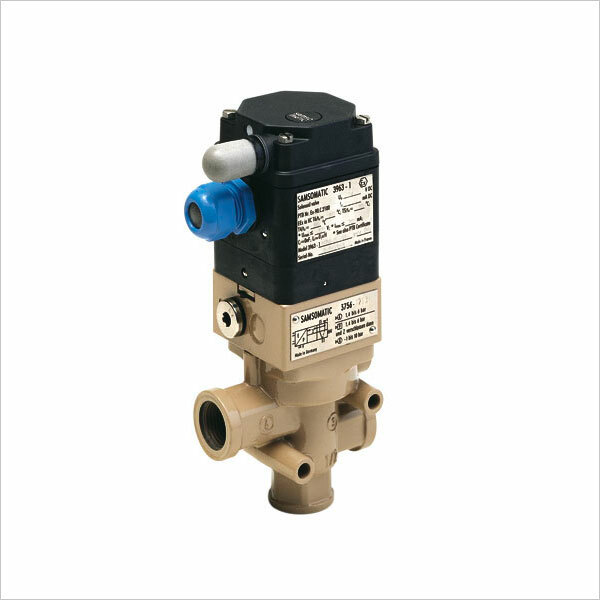 Pivoted-armature valves are provided with manual override as a standard feature.